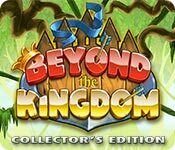 Beyond the Kingdom Collector's Edition is rated 4.2 out of 5 by 29. Rated 5 out of 5 by MsTeaQueen from Don't Underestimate This Game I've have played BF games for 5+ years and have never written a review....until now. After reading the reviews and playing the game, including the bonus levels, it became clear that most who have written their review "may not" have gone beyond the trial levels. What reviewers have stated is right on point, I just want to add additional info: Yes, it's true the game is easy in the early levels. As one reviewer described it "I didn't have to pause the game to take notes, I just started writing notes while I waited for the resources I had selected to be gathered". I had to smile at this statement because it's so true! However, as you progress it does get more challenging. There is a strategy guide, click on the "?" in the upper left corner, you may need or choose to use, as you progress. Strategy is required on advanced levels. While I was able to get 3 stars on some levels, some of those stars were earned by replay. There are levels that I replayed and still could only get either one or two stars. May have to refer to the strategy guide to get 3 stars. The bonus levels are difficult, although I managed to get 3 stars on 2 levels, on most of the BL I struggled to get 1 star. On one level I did not complete in time, that's right....zero star. The good news is you can move to the next level even if you manage not complete in time, with no stars. In summary, this game for me is colorful, challenging, entertaining, and at times mind boggling. So much to do and so little time to do it. Don't underestimate this game based on the demo, its deceiving. Rated 5 out of 5 by Magda640 from Easy-going and good for beginners (or oldsters) Okay, I admit it - I'm a grandma with less than good eyesight. I like to play games that are clear and colorful and not frenetic. I do own many murder/mystery games, but they are difficult to see. This one is not difficult at all. I can stop and check out all the scenery without sacrificing much time. Fact is, I most enjoy playing games on the casual setting. I do replay the Royal Envoy games for the same reasons. I think this is an excellent game for someone who is just starting out with time management/strategy games. Try it for yourself. Rated 5 out of 5 by MrsBen from WONDERFULLY CUTE GRAPHICS AND RELAXED GAMEPLAY! The graphics in this game are really good, clear and well done. In the introductory cut scene, you see King Archibald perusing a map in his crown, royal robe and his boxers. The detail is so clear, you can see his sparse little chest hair. Very cute characters!! 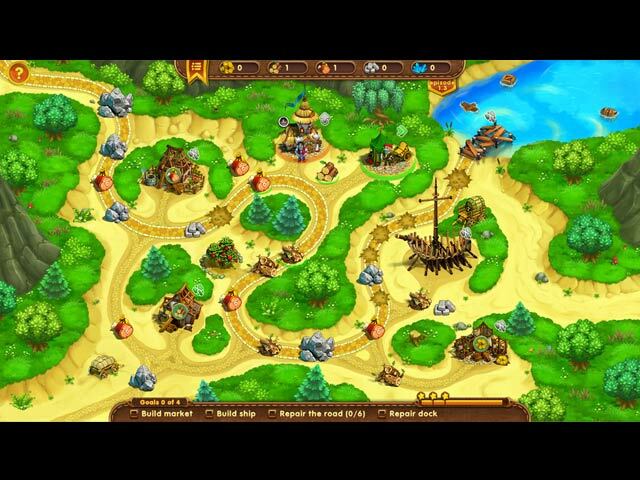 The gameplay is smooth and the game is great in relaxed mode. You can speed your little men up a bit now and then, if you like. All the buildings are recognizable for what they produce, as are the items they produce. Your goals are quite clear! Kick back in your little corner of the world-wide BFG pond and enjoy! Rated 5 out of 5 by DonaldSparrow from Great story and lot of fan I love time management games and this one is in my top list now. The graphics and music are superb.Charming and cut characters. Fun and detailed levels. Great storyline.. Excellent game!Well worth the money. Rated 5 out of 5 by 2020moonlanding from Wonderful This is a charming TM game. The graphics, music, and storyline are spot on with a keen attention to detail. There are two modes of play including a casual untimed mode. The tutorial is great if you are a new TM player and goals are clearly identified to complete each level. Game flow is flawless and I'm finding this game to be enjoyable. Rated 5 out of 5 by beezelbom from A New and Improved Royal Envoy! The Royal Envoy series is one of my all time game favorites. I love the graphics, and especially the music. So often the music in games is annoying and repetitious, the music here has a Celtic feel and is light and changes melodies. I love that there are two modes of game play, an experienced mode and a relaxed mode. I can no longer handle some of the more fast paced TM games so a relaxed mode suits me just fine. The game does not call itself Royal Envoy but all of the game components are the same. I am really enjoying this game and I do recommend it. Rated 4 out of 5 by iowavette from I like this game...a lot! This is a terrific TM game with lovely cartoon graphics, good music and responsive, intuitive controls. The game progresses to an appropriate degree, not ramping up immediately so the game can't even be played past a few episodes but allowing smooth, soothing transitions between levels. I'd like to see more in the series. Rated 4 out of 5 by jdhookstra from So close! I was so excited to try this game. Had been longing for another Royal Envoy or MKFTP. This has it all, BUT strategy. Moves are pretty much predetermined for the player - can doze off a little and still achieve three stars. Other than that - loved it. Rated 4 out of 5 by odarney from Nothing NEW - but I love it I am a huge advocate of TM games, and we haven't seen many in the past few months and I'm SO GLAD. This game is reminiscent of other TM games, but for some reason, this has a FUN feel to it! Rated 4 out of 5 by pennmom36 from I CAN DO NO WRONG, a seriously forgiving game The graphics are really good and I really liked some of the unusual tasks like repairing pirate ships and ridding the paths of those pesky Little Shop of Horrors plants. With that being said, this game became a maddening click-fest game because there are so many resources available that the tasks at hand require no effort or strategy to overcome. You only get two difficulty mode options, Easy or Challenge, and I was able to breeze through the demo with ease, in fact, I didn't have to pause the game to take notes, I just started writing notes while I waited for the resources I had selected to be gathered, and kept on going. You simply can't do something in the wrong order, there's no strategy required, therefore, there's no need for a Strategy Guide, if there's no need for a Strategy Guide, there's no need to buy this game in a Collector's Edition. It's enjoyable enough to play if you don't mind that it's a super easy game to complete, but personally, I will wait to buy this game until the Standard Edition version is released. 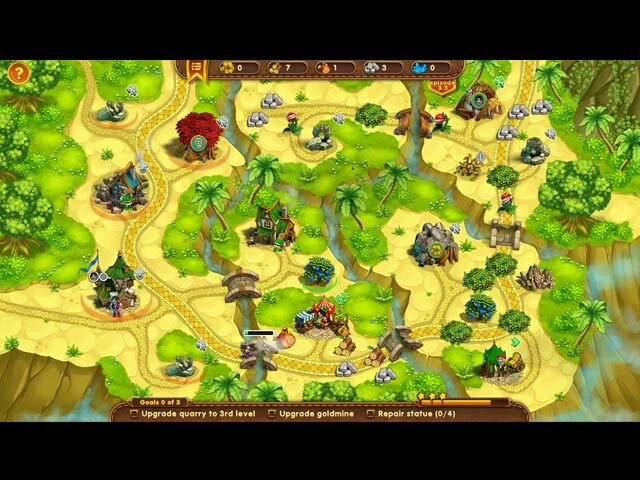 This game is played over 6 Islands beginning at your Native Valley and moving on to Skull Island, Tropical Bay, River Island, Rocky Isle and finally Northern Land. This Collector's Edition does include Extra Episodes, Concept Art and a Strategy Guide, but I just can't see spending twice as much for this game for a handful of extra levels and some cartoon sketches. There aren't any Morphs or Collectibles to persuade me to take the CE plunge, if there were, I probably would have grabbed it on a good sale. There are 31 Achievements to earn, but those are usually offered in the SE version as well, besides, they aren't difficult to earn and you'll probably earn a ton of them in the demo alone. There are the usual Time Management tasks such as clearing roads, repairing bridges, gathering food and other resources to help you progress. You will build or repair Farms to produce food, Sawmills for wood, Quarries for Stone, Huts and Gold Mines for revenue and various constructions for Markets to trade resources, Docks for Pirate Ships you've repaired and Hunter's Hut's to house hunters to remove wild animals. I love the Druids though, and some of the tasks were pretty creative. To sum it all up, the graphics are really good, this dev has added some nice details such as an eagle flying gracefully in the sky and some of the trees are colorful and realistic. If you just want to play an easy breezy game without having the added stress of strategy, and you don't mind the CE price, I think you'll enjoy this game. It would be nice if the Challenge mode was just their Normal mode, and they added a more challenging mode, enjoy! Rated 4 out of 5 by themaestro023 from Royal Envoy 3 design mixed with Kingdom Chronicles' gameplay This game has Royal Envoy 3's design, separate islands and the octopus floating around in between them and Kingdom Chronicles' style of gameplay. It is a little slow in between games with it zooming in to the islands showing the various levels you have yet to play and then zooming out to let you select the next level. But, the story is quite good, gameplay is slick with no bugs, music is acceptable and the game sounds are ok. I played two levels of the demo and then bought it using today's 60% discount. It's a bit of fun especially with hardly any TM games about at the moment. Try the demo and see what you think. Rated 4 out of 5 by joybelle_1 from Just missing one thing, Strategy I dearly would have loved to give this game 5 stars, but I just couldn't due to the total lack of challenge. Everything about this game is a delight, the characters, the story, the smooth gameplay, the wonderful graphics and the wonderful array of different tasks that must be done. 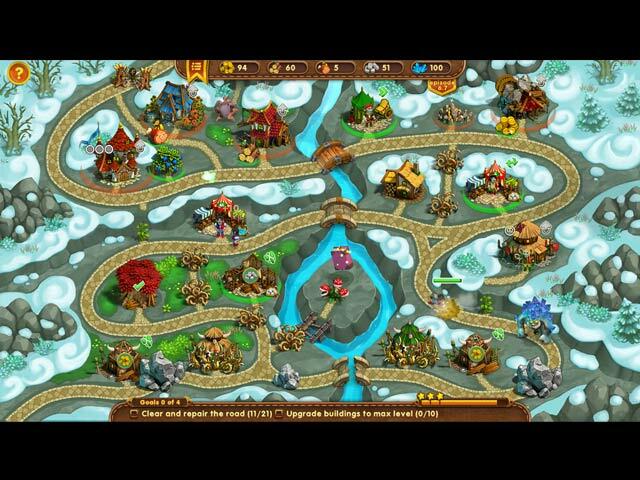 Clear nasty plants, spider webs, bombs, build hunting lodges, wizards quarters, and storehouses which add resources. In some ways it is a wonderful mixture of many TM games before it. Shades of Royal Envoy in the map and smoke hiding things, Hercules the way the resources are circled, and MKFP with the giant rock clearing. It is unfortunately so easy as where the circles show available resources they also only take you exactly where you need to go. Anytime I thought "oh I need wood' there it suddenly was available. As soon as upgrades were shown, I learned I may as well do it because the game knows I will need that lol. I always finished the levels without any anxiety and time on the bar. One time I mistook my warrior for my wizard icon, and still had time to wander over, build the wizard home way after it told me and still beat the level. It is a delightful game and such a shame it leads you everywhere. There is not one thing wrong with this game other than its TOO EASY. I can't recommend it as a CE, because the main feature is always the strategy guide and you wont need it. There is music and wallpapers too. For a beginner or young player this would be fabulous, but not for we TM players who thrive on strategic upgrades and direction choices. I do recommend the game if you are not chasing a challenge. I am still enjoying it just for the fun and relaxation, like chilling out with mindless match 3. Rated 3 out of 5 by jmpjack from Not worth the CE price I'm only giving this a 3 star as I really don't think that 38 episodes on the main game plus only 10 on the "Extra" games is worth a CE price. True the game is new and novel but it is no Royal Envoy. There is no story to follow and you have no affinity with any of the characters. I cant comment on the visual/sound as I always turn this off. Challenging? Well, I did have to repeat some of the episodes to get 3 stars but I didn't have to use the Strategy guide at all. Would I like to see another one? Yes as there are so few TM games, but they must provide more episodes if they want to charge a CE price. Rated 3 out of 5 by GJMcG from Can't compare to Royal Envoy series I read another review that compared this game to Royal Envoy, and that impacted my decision to purchase this game. Beyond the Kingdom is a good time management game. It gets more challenging as you progress through the episodes, but it is far too linear for my taste. Unlike Royal Envoy, you cannot choose which buildings to build and/or upgrade. They already exist and you just repair them. There is no way to demolish them and build something else. That is my favorite factor in the Royal Envoy series... with very few exceptions you have complete control over what you build. That is part of the challenge! You need to build the right buildings and frequently the order in which you build them can determine success or failure. Beyond the Kingdom is a decent game. It runs smoothly and the graphics are nice. But I was very disappointed that it is so linear. In each episode, what you see is what you get. Point, click, gather resources, point, click, repair buildings, point, click, repair bridges... rinse and repeat. I am recommending this game because it is decent, but it is a qualified recommendation because it did not meet my expectations. Rated 3 out of 5 by plat1098 from New Game But I've Played This Many Times Before A vibrant playing field, encompassing your whole screen, lots of cute objects to look at and 2 game modes (timed and untimed) to choose. Problem is: been there, done that. The sawmill, farm, quarry, market, etc are all staples in previous timed resource management classics. The thatched huts--you've seen them before, same for the map (almost a spitting image). On the plus side, tutorial and dialogs can be diabled in-game and the gameplay itself is familiar and as fast-paced as you want it to be. In-game, a task or object to be built/picked up may have a red or green ring-like indicator to show availability. This was the deal-breaker for me, I can (and do!) check this myself, no need to spoon-feed. Cute game and very familiar in more ways than one, though a couple of unique elements save this from total imitation. Thanks, I already have Royal Envoy, Kingdom Chronicles and Northern Tale, which is what Beyond Kingdom is a mashup of. I suggest trying the demo at least. Rated 2 out of 5 by KeelyAm from Not at all like RE. I bought this game based on another reviewer saying it's like RE. It's not beyond basic build aspects. I play a lot of TM games, but there is something about this one that is tedious. I finished it because I purchased it, but otherwise often wondered why I was still playing. The workers are painfully slow. They take forever to do anything. A good portion of every level is spent simply waiting for enough resources to drop. Contrary to some reviews, if you are experienced at TM games, it does not get much harder as it goes along. There were less than a handful of levels I needed to replay and even at the end, I often finished levels with well over 1/4 a bar left Above the expert star. As a series, it has potential if they fix the pacing, but this one is better skipped. Rated 2 out of 5 by rpadder from Same things I got this game and I was playing till I open the bonus levels then the 3 levels I played I had to shut down the computer then when I started to play it the next day I had to start the last 3 levels again, then played 2 more levels and quit. So I starter to play it again and the same mess I had to do all the bonus level till the end level which I could not get through. Maybe you might like this by other peoples reviews but I think it is crappy and some parts are very BORING. Rated 2 out of 5 by nwl43 from BEWARE! Please be aware that the story line is not completed. Following the last episode you will receive the following message: "TO BE CONTINUED". For this reason I cannot recommend this game.